For more than 26 years, God has used the evangelical church in Brazil in a powerful way through the March for Jesus Festival. Each year, hundreds of thousands of individuals gather together in São Paulo to worship the Lord and proclaim His Good News. This year, Andrew Palau was invited to be the main evangelist to address the massive crowd and share the life-saving message of Jesus. 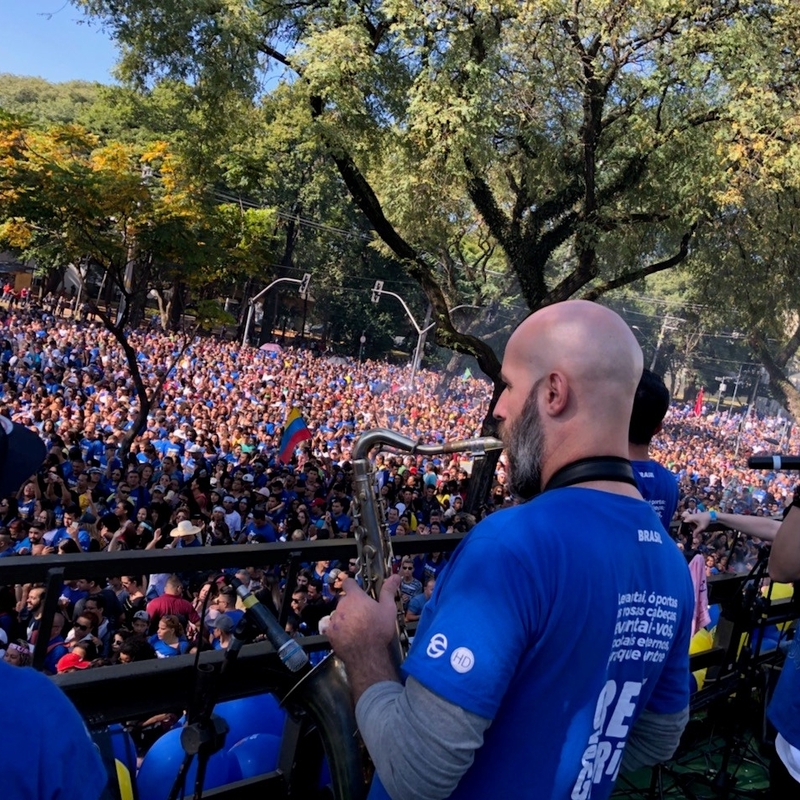 Global evangelist Andrew Palau, son of Luis Palau, was the featured speaker this past week at the massive March for Jesus Festival in São Paulo, Brazil (population: 12 million). 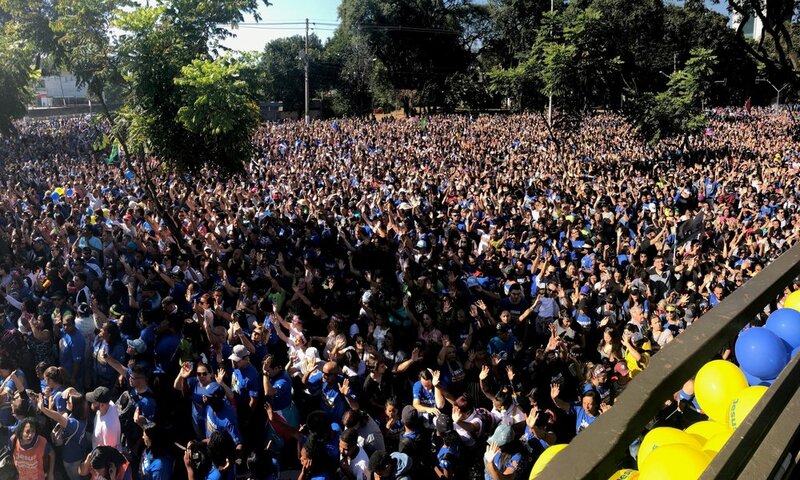 The event is being hailed as one of the largest gatherings of its kind and proved to be a truly blessed Gospel moment for the Church and the nation. Organized by the local evangelical community and supported by hundreds of local congregations, the event built off of 25 years of similar marches and rallies. 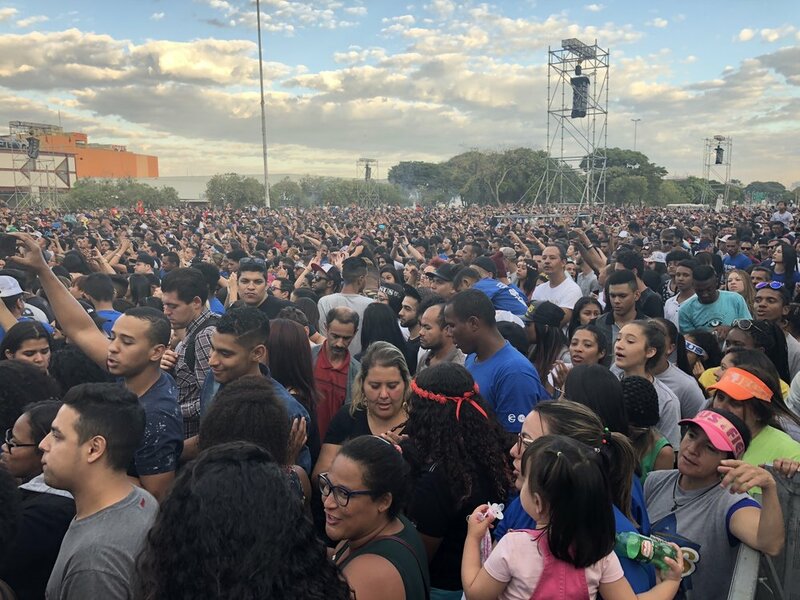 This gathering in São Paulo grabbed the attention of the entire continent and brought the Gospel to millions through the live event and surrounding media. Coming at the end of an 8-day transportation strike that paralyzed the city, the organizers overcame numerous challenges to accomplish the historic event. Starting at 10 in the morning on May 31, ten massive semi-trailers equipped with sound and stages led the crowd in joyful celebration on a 3 mile march through the city. The crowd swelled to several hundred thousand as the parade progressed, eventually filling many city blocks of the 8-lane boulevard near the Praça Campo de Bagatelle park where a massive stage had been erected for the evening festival. A variety of musical artists performed throughout the night, culminating with a clear Gospel message from Palau. “To see so many people marching in unity of their dedication to follow Jesus together – it was truly unbelievable,” said Palau. Focusing his message on John 10:10 – “The thief comes only to steal and kill and destroy; I have come that they may have life, and have it to the full” – Palau ended his message with a clear call to faith and repentance. The sea of hands that raised in affirmation to his call was evidence of the impact of the Word. He went on to imploring those who had publicly confessed Jesus Christ to dig into Scripture, get their roots deep into a local church, and pursue God daily. The local participating churches will work over the next several weeks to connect with and disciple those who made decisions. 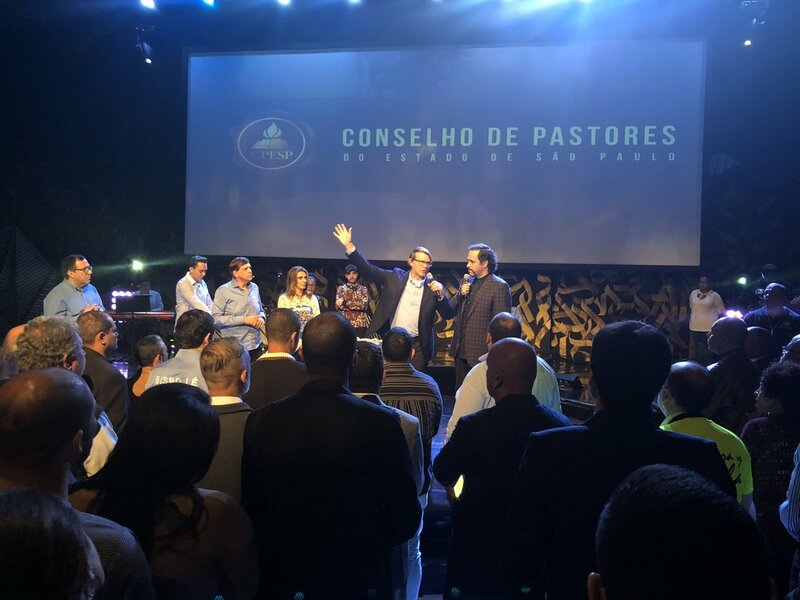 During Palau’s time in Brazil he also gathered with local pastors, church leaders, and evangelists, encouraging them in the Word, focusing on continuing in unity, and inspiring them to keep evangelism a top priority. Palau’s father, the famed Latin evangelist Luis Palau, was originally invited to share the Good News at the event in Brazil. Due to his recent stage IV lung cancer diagnosis, he was not able to make it to the event but was overjoyed to have his son Andrew take his place. To learn more about March for Jesus, visit http://marchaparajesus.com.br. The next festival with Palau will take place in Sunbury, England, June 13-17, 2018. Andrew Palau will also travel throughout the United States and to Colombia, Argentina, and China later this year to lead outreaches in several additional cities. Learn more at www.palau.org. The crowd is still growing! Such an awesome sight. Keep praying. I take the stage to share the Good News soon. It's 10am here in Brazil and already hundreds of thousands gathering for the March for Jesus Festival. Crowd continues to grow. I will preach at 6pm tonight. I wish you all could be here. It’s quite a site. Cell towers are jammed, as you can imagine. I’ll do my best to keep sending photos, videos, and reports.